For decades the Anangu people in central Australia have asked tourists not to climb Uluru, formerly known as Ayers Rock, because of its sacred value. From next year, scaling the giant monolith will be banned. The BBC's Rebecca Henschke reports on why the rock is so significant, and discovers her own personal link along the way. 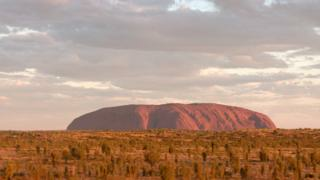 "When tourists come they just see this one big beautiful rock in the centre of Australia. But this rock means everything to us Anangu." Pamela Taylor stares up at the mighty rock. She is one of the traditional owners of Uluru and a holder of the ancient sacred stories that are enshrined within it. "The rock has got a lot of stories," she says as we sit down in the red sand. "Some of them I can't tell you. [They are] too sacred or we will be in trouble - I will be in trouble. Some I tell so people like you can understand." The stories are passed down orally as precious inheritance through families. The Anangu believe that in the beginning, the world was unformed and featureless. Ancestral beings emerged from this void and travelled across the land, creating all living species and forms. Uluru is the physical evidence of the feats performed by ancestral beings during this creation time. Ms Taylor points to a deep cave high in the rock. "Blue tongue lizard lives right up the top there," she says. Her family holds the story of Lungkata, a greedy and dishonest blue-tongue lizard ancestral being, who came to Uluru from the north and stole meat from Emu. When Emu followed him back to his cave, Lungkata ignored him. "He went back to sleep, pretending he was asleep. Emu got very angry and made a fire and it went right up into the cave and the smoke blocked him and he fell down," Ms Taylor says. She points to a huge blue patch that runs down from the cave. That is where his burnt body rolled down and left a mark, she says. "He did bad things by going around stealing. That's why we tell the children not to go around stealing things, because they will get punishment like Lungkata." "I tell [the] story about that to my grandsons, so they learn." The caves, lines and marks on the rock all have deep meaning, and stories that tell how they were created. The family of Sammy Wilson, another traditional owner, holds the story of Kuniya, a woman python at Uluru. She fought Liru, a poisonous snake, at Uluru, to protect her nephew. Signs of that ferocious battle are all around a waterhole at the base of the rock, he says. Mr Wilson points out Kuniya herself in the stone, the image of her python head turning to look back. "When you go to a city, you find parks with statues of someone who has done something important," he says. "Well this is equivalent of a statue like that. This is what we have in our country to show us our past." And elders say that when you climb Uluru, you are on the traditional route taken by ancestral Mala men - a path of deep spiritual significance. "Tourists are like ants up and down every day, climbing up and down," says Ms Taylor. "Their shoes they are scraping away at the rock, little by little bit. It's now like a rope when you see it from far away. It wasn't meant to be like that." Signs in six languages at the base of Uluru ask people not to climb the rock, explaining that it violates traditional law. But despite that, every day that I have been here a steady stream of people have gone up. Many have come to climb it before it is closed next year. One tourist from Queensland, Pamela, says she read the signs. But she says: "I am going to do it anyway because this will be the last chance, because next year they are closing it off and next year I will be too old." She admits she hasn't thought too much about the sacred nature of the rock. "It's because of my ego I want to climb it," she says. "I just turned 70 and I have two replacement knees and I want to see if I can do it." For Mr Wilson, it's a painful thing to watch. "Sometimes it feels like I could be talking and talking until I am exhausted and worn out and some people would still not understand," he says. "We have been talking for so long about wanting to have it closed, that some of our elders have passed away." Mr Wilson is a member of the Uluru-Kata Tjuta Board, which jointly manages the national park. In a historic vote last year, its board of 12 people - including eight Anangu elders - decided to end the climb. "I was there on that day, and there were tears in people's eyes. Not just Anangu, but people who have been here for many, many years," says Steve Baldwin, manager of the Uluru and Kata-Tjuta Park Operations and Visitor Service. "Everyone felt so relieved that finally it's being closed," he adds. "Anangu are very mindful that for tourism, there are many people who want to climb Uluru," he says. "And that's why you have the lead time of two years. They have done things the right way." But for the Anangu people, mass tourism on their land hasn't been done the right way for decades. Should I have climbed Uluru? Why doesn't Australia have a treaty? It was not until 1979 that they were recognised as traditional owners of this land - despite living there for more than 40,000 years. It took another six years to be presented with the freehold title deeds for the area - an event known as the "Handback". And it was not until 2001 that there was an official Anangu ranger of the park. The threat of losing tourism felt like a gun being held to their head, says Mr Wilson. "That's what it felt like - people trying to stop us from expressing ourselves," he says. "[They were] stopping us from doing what we needed to do - what we felt was right - so we just asked, please put that gun aside so that we can talk properly." Mr Wilson has set up his own tourism company for visitors to see the land through the eyes of the Anangu people. "This is our country here and we want people to come and learn from us and how sacred it is," he says. I grew up on Anēwan land, in Armidale, in an area of European settlers called New England. But my family on my father's side were among the first settlers to come from Europe to South Australia. And while I was working on this story I realised I had a much closer connection to Uluru, or Ayers Rock, than I had realised. In 1873, when European explorer William Gosse came across the giant rock in the middle of the desert, he named it after the chief secretary of South Australia at the time, Henry Ayers, who is my great great great great uncle. He married my ancestor Lady Anne Ayers. I tell Mr Wilson that I am sorry for that ignorant act and my family's role in disrespecting the indigenous people of this land. His reaction surprises me. He is excited - because he says his great great grandfather met Mr Gosse. "He wrote down my ancestor's name down too! The blue tongue lizard ancestor," he says. "I have no idea why they gave it that name (Ayers Rock). White fellows seem to give names randomly," he laughs. Later I tell another Anangu elder, Alison Hunt, and apologise again for my family's role. "Oh, that's interesting!" she says. "But Aboriginal people don't hold grudges, because that was done in the past," she adds, kindly. "Now today Aboriginal people want to walk together with non-indigenous people and develop that understanding, and that trust about what happened rather than living in the past," she says, while giving me a cuddle. "We all about coming together." Last year about 300 Aboriginal and Torres Strait Islander people came together at Uluru, to demand real legal and political recognition and power as the first peoples of Australia. The Australian government later rejected a proposal to form a body in parliament representing indigenous peoples. The response drew criticism from Aboriginal leaders. More than 200 years since the British invasion, Australia remains the only Commonwealth country to have never signed a treaty with its first inhabitants. "Government and people should respect and recognise that we are the first people of the land," says Ms Hunt. To the rhythm of clapping sticks, Ms Hunt sways, slowly moving forward, sliding her feet through the rich red sand, her bare breasts painted with markings. This is an inma, or welcome ceremony for tourists who are here for a cultural festival called Tjungu that showcases indigenous music and arts from across the country. Also performing is a schoolgirl drumming group Drum Atweme. Speaking to the girls after the show, it's clear that despite enormous pressure the sacred stories are being passed on. "When I go to the rock and see the paintings in the cave I felt like my great great great grandfather is right beside me," says 11-year-old Tilley. "We are not allowed to go on the rock or you will be sick because you are stepping on your culture and on your dreaming." With the closing of the climb, the elders hope visitors can spend more time talking with them to understand this. "There will be more time to sit and talk like we are doing here - right now there is not enough of this kind of talking," says Ms Taylor. Reclaiming the Rock will air on the BBC News channel on Saturday 30 June at 0930 and 2130 (GMT), and Sunday 1 July at 0230 and 1530 (GMT), and at various times across the weekend on BBC World. You can also listen to Rebecca Henschke's World Service documentary on the BBC World Service website.